"This is a beautiful gathering. Gee whiz." The Last of the Blue Devils were the surviving members of the group of African American artists who popularized the jazz and blues (and rock'n'roll) sound of the mid-Twentieth Century. In the mid-1970s, director Bruce Ricker spent several weekends filming Count Basie, Big Joe Turner, Jay McShann and their colleagues at the old musician's union hall in Kansas City, where long-ago jam sessions gave birth to such classics as One O' Clock Jump and Shake, Rattle and Roll. The musicians perform and reminisce in a candid, casual setting that allows the sometimes rivals to relax and enjoy themselves, complete with cigarettes and beer. Their pleasure in the music is infectious, and only the most tone-deaf will be able to resist the toe-tapping vibe of Moten Swing or Jumpin' at the Woodside. Count Basie discusses his years with Benny Goodman, Big Joe Turner thoroughly enjoys himself, and Ernie Williams emcees and dispenses earnest advice to kids on the street. The overall impression is one of masters at play, relaxing and performing without the arrogance and posturing that too often characterize "behind-the-scenes" footage of established musicians. These are regular (albeit extremely talented) guys, having a wonderful time together, and performance segments are allowed to run at length, with no external pacing pressure imposed on the material. The interview segments are similarly unstructured, allowing the artists to articulate life stories, humorous anecdotes and half-voiced regrets with little interference by the filmmakers. There are, unfortunately, times when this refreshingly casual approach extends a little too far into the production itself. The handheld cinematography is woefully amateurish, with dirty lenses, crash zooms and awkward framing that makes the film look more like a home movie than a serious documentary. Heads are cut off, focus is uneven and visible splices turn up in a few spots. It's telling that archival film footage often looks better than the new material, and none of the sound is particularly well captured, with uneven vocals and mixing throughout, a serious flaw in a music oriented title. Director Bruce Ricker also employs a Woodstock-style split-screen gimmick without much success�two badly-framed angles on the same shot don't make a winning combination. 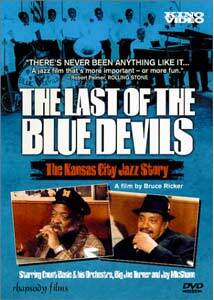 Still, The Last of the Blue Devils is an important record of the Kansas City jazz scene; most of the greats captured in Ricker's 1979 film have since passed on. One wishes for higher quality, to be sure, but the historical value of the footage cannot be dismissed. Image Transfer Review: The Last of the Blue Devils is presented in its original 1.66:1 widescreen theatrical aspect ratio, with a nonanamorphic transfer. The 16mm-originated source materials are clearly in middling condition, with significant grain and general softness, and often looks like a home movie. Worse, the DVD appears to have been taken from a recycled laserdisc transfer, with chroma noise, 3:2 pulldown and a hint of MPEG color banding here and there. I'd have been inclined to attribute the generally poor shadow detail and fuzzy image quality to the low-budget source, were it not for the fact that the "outtake" supplements look so much better than the feature. A disappointment in this department. Audio Transfer Review: The movie is presented in Dolby 2.0 monophonic format, for ProLogic decoding to the center channel. The soundtrack suffers from excessive hiss, muddiness and frequency range clipping, with subwoofer-level microphone vibration noise that rumbles through most of the presentation. There are also times when the mono optical track seems to have been picked up unevenly by a stereo head, leading to momentary, unintended left/right splits. It's listenable, but the film soundtrack was recorded with minimal equipment and rarely does justice to the musicians involved. The supplemental "outtake" clips feature significantly cleaner audio, presumably drawn from the original master tapes, and it's a shame the feature soundtrack has dated so poorly. Were this any other sort of film, the audio would rate a notch higher, but the music's the thing here, and the disc just doesn't deliver. Director/producer resident Bruce Ricker contributes a running constant commentary on the making of the film and his interest in the subject. Exurbanite New Yorker Ricker (who sounds uncannily like Harry Chapin sometimes) rambles animatedly about the history of Kansas City jazz, structural editing decisions and the production process at large. The project was clearly a labor of love, and Ricker communicates his affection for it with enthusiasm and a certain geeky energy. Two outtake reels are included, featuring material not included in the final film, presented in 1.33:1 full-frame format. Both segments (about 19 minutes total) were shot at the same session, featuring Big Joe Turner and Jay McShann performing Honey Hush, Rose Garden, Chains of Love, and parts of Shake, Rattle and Roll. Oddly, the audio/video quality of these "deleted scenes" is MUCH better than that of the feature attraction; perhaps these archival materials were given new transfers and mixes for DVD. The Last of the Blue Devils captures several of America's greatest jazz and blues performers in a casual Kansas City setting. Kino on Video's DVD transfer can't help the dated, grainy source material much, but it's still a valuable glimpse of vital figures in musical history. A must-see for jazz fans.